Thoughts on software development: High Performance Webapps. Use Data URIs. Practice. High Performance Webapps. Use Data URIs. Practice. The second tip is to use data URIs for small images, up to 1-2 KB. It's not worth to use data URIs for large images. 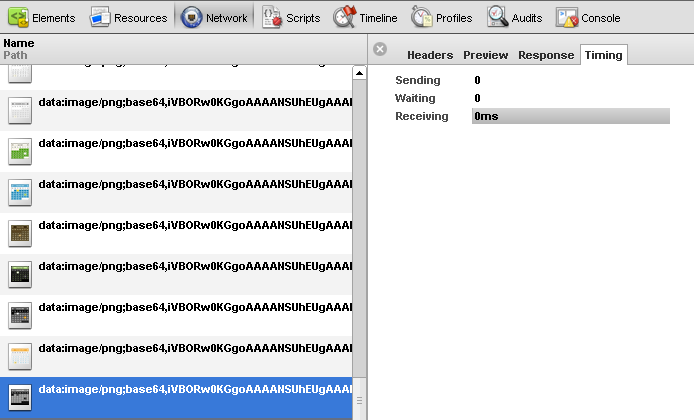 A large image has a very long data URI string (base64 encoded string) which can increase the size of CSS file. Files with a big size can block loading of other files. Remember, browsers have connection limitations. They can normally open 2-8 conection to the same domain. That means only 2-8 files can be loaded parallel at the same time. After reading some comments in internet I got an acknowledge about my assumption with 1-2 KB images. 65 requests. Page loading time 3.84s (onload: 4.14s). 34 requests. Page loading time 3.15s (onload: 3.33s). There isn't much difference for subsequent calls (page refreshes), but there is a significant difference for the first time visiting. Especially onload event occurs faster with data URIs. No wonder. Images being loading after document is ready. Because they can not be loaded parallel (number of opened connection is limited), they get blocked. 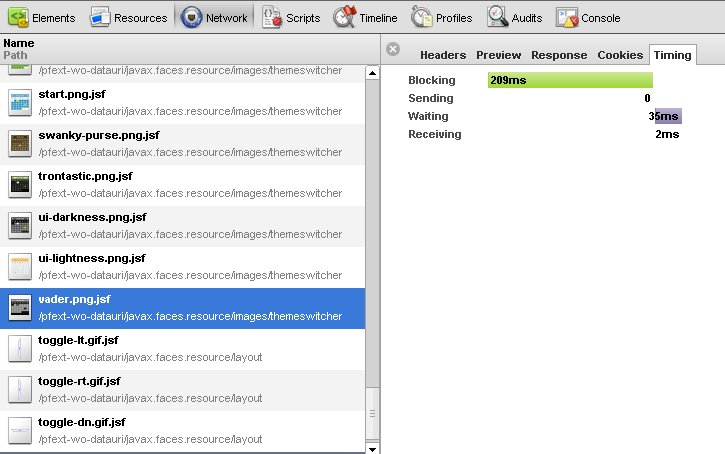 I took some pictures from Google Chrome Web Inspector. Below you can see timing for an image (vader.png) for the first (regular) case without data URI. And the second case for the same image encoded as data URI. 65 requests. Page loading time 3.18s (onload: 3.81s). 34 requests. Page loading time 3.03s (onload: 3.19s). Now in web page developing HTML5 and CSS3 Design is lame light in all over the world and as we all know that the new progress in any thing is also add some complexity. thanks. v interesting and well researched. appreciate. High Performance Webapps. Use Data URIs. Theory.